Femur rotation is a darling of ski instruction these days and we can see why: people have reasonable control over their big muscle groups, especially when beginners are the target. But does it really lead to performance skiing or does it lead one to be stuck on the fabled "intermediate plateau"? What are the alternatives? Read on! This is an add-on to the Femur rotation post - we will revisit some of the issues from there and consider some of the implications for high-performance skiing, but be sure to read that first! The femur needs to rotate in the hip socket, for anyone to do pretty much anything other than standing up or sitting down. In fact, even to sit down or walk about, you'll rotate the femurs in one way or another. As discussed in Femur rotation, the result of active femur rotation is whether the skis are pivoted (long legs) or are put on edge (short legs). Let's consider however the line of thought that says that edging is a result of active femur rotation. This seems to imply that the foot is not active, that there is no inversion/eversion. This will be a negative outcome, as the foot will not be involved. So - yes, certain active femur rotation with short legs will result in the skis going on edge, but if the feet are not involved, it is not that good. If, on the other hand, the boots are edged because of the foot and ankle action, i.e. foot tipping, then we see the accompanying femur rotation as a result, as discussed at length in Femur rotation. Well, since we prefer to always ski with our feet, much like in walking or running, we will always prefer to have a bottom-up activation of the kinetic chain and will always prefer foot tipping for putting the skis on edge. Let's start to look at this from a different perspective: the release of the previous turn! A great turn is the continuation of the previous great turn. The release of the current turn allows us to create the next turn and these two are intricately connected. If we have a great release. we can have a great next turn! This is discussed at length and in detail in Release untip to skis flat. Let's look at a high-performance release: from right to left, the outside leg will relax and will result in flexing the outside leg, at the hip and at the knee (blue arrow). What will you do with the foot and ankle of the same outside leg? Will you leave them relaxed? Consider for a second what happens if you leave them relaxed: as the entire leg relaxes, the hips will move down the hill and into the new turn, resulting in Hip dump! In all high-performance releases, it is mandatory that the foot and ankle strongly untip the ski to flat, otherwise it will result in hip dumping! Having discovered that, let's pause for a second. You need to strongly activate the feet and untip the skis to flat, as part of any high-performance release, as the rest of the leg is relaxed. This simple movement, together with the hips moving in, will result in edging as the new turn builds up! Nowhere did we need any kind of femur rotation to end the new turn or create the new turn! 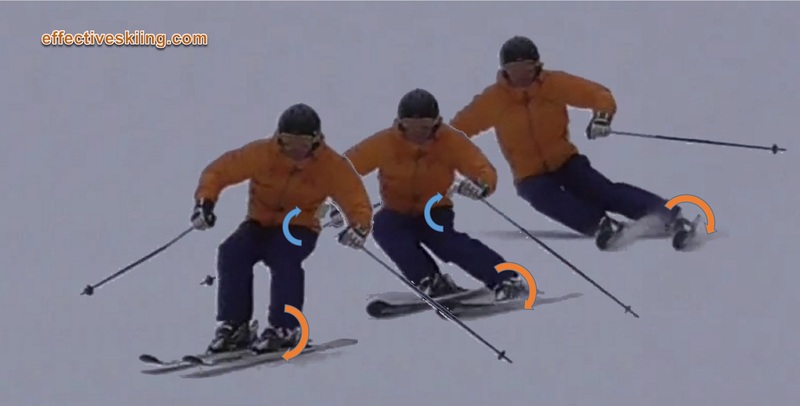 Look at the top right - what would femur rotation achieve there, when the ski is engaged, the leg long and strong? Nothing really, other than make you lose the outside ski. Only towards the end of the release, in frames 2 and 3 (center-left) will some femur rotation help! So should you focus on the femur rotation? Or on JUST relaxation and untipping? Food for thought! I focus only on the relaxation of the outside leg and untipping and foot tipping. I rarely need anything resembling a strong active femur rotation at any point - perhaps sometimes when I need a very quick switch, a very quick transition, but otherwise, between relaxing the outside leg and foot tipping, nothing else is needed, as far as edging goes. Note that a passive femur rotation is required for any good skiing! So, going back to the original questions: can active femur rotation result in high-performance skiing? The answer is no!. Is foot tipping a pre-requisite for high-performance skiing? The answer, I think you can agree, is a big yes!. Viewed 129 times ( | Print ) this page.